Why on earth were Joseph’s brothers so bent outta shape over Joseph’s coat? I mean, it was ONLY A COAT, right? No; not exactly. Jacob didn’t give Joseph just ANY coat; he gave him a KETTONETH. (Ke-tō-nét). “What’s that, you ask?” Come and see! A Kettoneth is a long-sleeved garment made out of VERY fine linen. In the Hebrew Bible, the varicolored coat, or “Kettoneth passim,” is the garment that Joseph owned. This phrase is usually translated as “Coat of many colors.” But some have suggested that the phrase may merely mean a “coat with long sleeves” or a “long coat with stripes,” as pictured below. 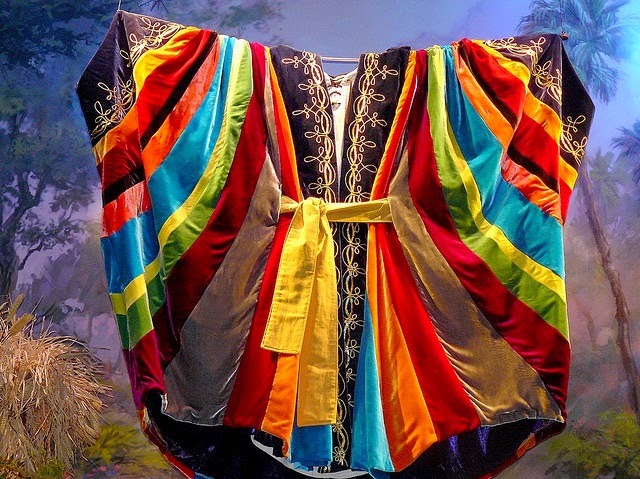 The Septuagint (Greek translation of the Old Testament) translation of the passage uses the word “Poikilos,” which indicates “many colored.” The Jewish Publication Society of America also employs the phrase “coat of many colors,” in their version. “So, what’s the big deal about a coat with long sleeves?” Ever see pictures of people in Bible times? Most of them wore coarse, sleeveless garments because: #1: It’s a hot climate and, #2: THEY WERE WORKING!! A garment like this coat was also unbelievably expensive. Only nobility and the very wealthy could even afford to wear something like this. Here’s the kicker: The long sleeves indicated THEY WERE PRIVILEDGED AND DIDN’T HAVE TO WORK. 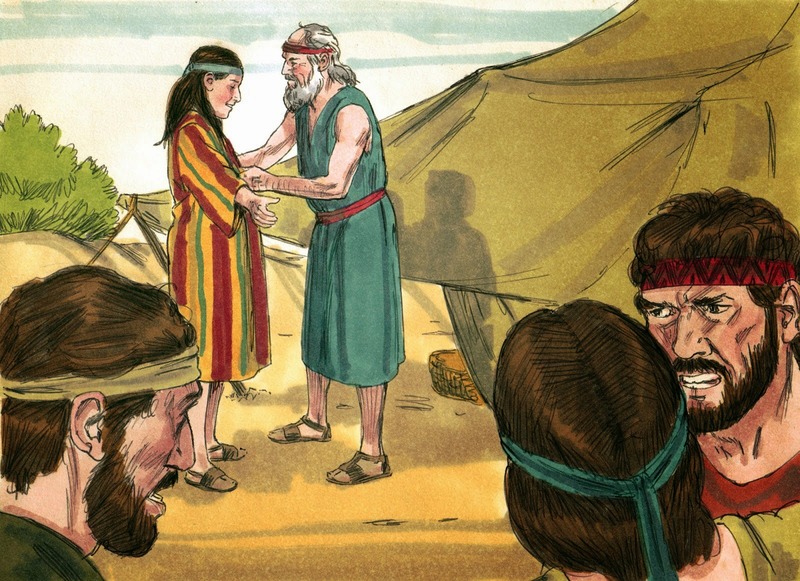 Jacob was basically saying that Joseph, UNLIKE THE REST OF HIS BROTHERS, was never going to have to lift a finger to do anything for the rest of his life! Now do you see what the other sons were so upset? Their response was so intense that it went far beyond simple envy; it was a jealous rage with murderous intent. The first mention of any word or theme in scripture is very important. There is a “law of first-mention,” if you will, in the interpretation of scripture. It is a principle which states that the first mention or occurrence of a subject in Scripture establishes an unchangeable pattern, with that subject remaining unchanged in the mind of God throughout Scripture. There is always something very important in the first mention of any word or subject that sheds light on its meaning throughout the Bible. This word, “Kettoneth,” first mentioned in Genesis 3:1. God made “Kethoneth” of skins for Adam and Eve. He was demonstrting to them that without the shedding of blood, there is no forgiveness of sin. He was also showing them that they can rest in His provision. Most artist renderings of our first parents have them wearing skimpy clothing made of animal skins. This demonstrated a basic misunderstanding. They were actually covered from neck to feet and had long sleeves! God (obviously) had to kill animals, probably a ram, in order to fashion clothing from their hides. That’s right folks, God offered the first blood sacrifice. In fact, He offered both the very first sacrifice to make a blood covering for our first parents and the very last one: His Beloved Son, Jesus, the sacrifice to end ALL sacrifices. Adam and Eve were covered by the blood sacrifice of the innocent lamb, a picture of Jesus death on the cross in the distant future. They Cast Lots For Jesus’ Coat. 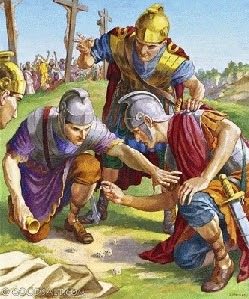 It was Jesus’ “kethoneth” for which the soldiers cast lots at the foot of the cross. His was made of he finest white linen, a “seamless” garment; seamless like His character. Nothing coarse or uneven about Him. It was so expensive that it beyond price! That is so not like you and I, who have His righteous “sewn” into us. It was a garment fit for the King of Kings and the Lord of Lords that He is; the altogether lovely One! White typifies purity and righteousness in the Bible. It is this same white garment with which the saints in Revelation are clothed. As believers, you and I wear His garment of righteousness and purity. Because it is a “KETTONETH,” it signifies that WE DON’T HAVE TO WORK FOR OUR SALVATION: IT IS FINISHED! So you see, Joseph’t coat was FAR MORE than just a pretty COAT OF MANY COLORS. ← God’s Perfect Governing Plan.